Meal prep these protein and veggie packed Muffin Tin Veggie Frittatas for a quick breakfast made more delicious with my secret ingredient. Meal prepping is key to helping busy people live healthier. After all, surveys reveal the number one reason people skip breakfast is lack of time. 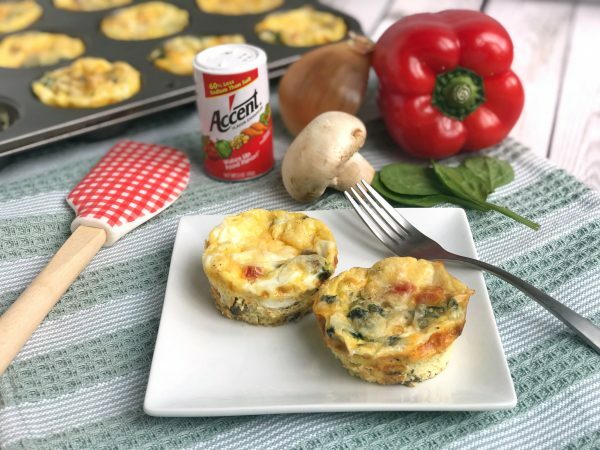 My tasty Muffin Tin Veggie Frittatas make breakfast easy with the bonus of 4 different veggies to help you jump start your produce intake for the day. And, I used a secret ingredient to help lower the sodium by 25%- MSG! Yes, I said MSG. MSG seasoning is also known as umami seasoning. Umami is the core fifth taste—scientists identified umami taste receptors on the human tongue in 2002 (alongside sweet, salty, sour and bitter taste buds). Meaning, umami is an inherent taste universally enjoyed. To get technical, umami is the taste of glutamate, an amino acid that is one of the building blocks of protein. Glutamate occurs naturally in the human body and in many delicious foods we eat every day, including, but certainly not limited to, aged cheeses, cured meats, tomatoes, mushrooms, salmon, steak, anchovies, green tea and more. Glutamate is even present in breastmilk! Monosodium glutamate (MSG) is a seasoning that combines sodium (like that in table salt) with glutamate, the most abundant amino acid in nature. MSG separates into sodium and glutamate when it’s exposed to water in foods or saliva in the mouth, which is why the body cannot distinguish between the glutamate naturally present in foods (such as Parmesan cheese) and added MSG. MSG is a quick and easy way to deliver savory deliciousness to foods and added dimension to flavors. It can be used to build savory, rounded flavors that enhance plant-based dishes. The reason I’m interested in MSG is for sodium reduction. In cooking, one part MSG to two parts table salt gives foods a flavor boost while decreasing sodium by 25 percent, compared to table salt. That’s a big difference and as a nation, we simply consume too much sodium. How do we know MSG is safe? Simply put, MSG has been used worldwide in cooking for centuries. If you grew up with an Ac’cent seasoning container in your kitchen, you were enjoying it too. I love the flavor boost it provides to eggs and vegetables. Give it a try and let me know what you think. Heat a skillet on medium/high heat, add olive oil and sauté peppers, mushrooms and onions until soft, about 10-12 minutes. Remove veggies from heat as set aside. Combine eggs, whites, milk, Ac’cent, salt and pepper in a medium bowl and whisk to combine. Stir in 2/3 of the cheese and veggies. Grease muffin tins well with oil. Pour egg mixture into tins (about 1/3 cup each). Top with remaining cheese. Bake for about 18-20 minutes until set, do not overcook. Remove frittatas and place on a rack to cool. Refrigerate and reheat leftovers to enjoy for up to 5 days. What questions do you have regarding MSG? Look for more of my recipes and videos coming soon! JECFA. Joint FAO/WHO Expert Committee on Food Additives. (1988). L-glutamic acid and its ammonium, calcium, monosodium and potassium salts In: Toxicological evaluation of certain food additives and contaminants. 97–161. New York: Cambridge University Press. 3. FASEB. Federation of American Societies of Experimental Biology. (1995). Analysis of adverse reactions to monosodium glutamate. Washington, DC: Life Sciences Research Office – FASEB. 7. Kwok R. H. M. (1968). Chinese-restaurant syndrome [letter]. New England Journal of Medicine, 278, 796.